The phone kept ringing and ringing, a torturing reminder of the horrible news Courtney Lee did not want to believe. Danny Rumph had gotten Lee through the tough times. They had become the sort of roommates who tell each other everything, who shared youthful dreams. Rumph was young and strong, gifted with abilities both thought would take him to the NBA. Yet every time the phone rang that terrible day, Lee was forced to accept the impossible truth. “It was a week after we left school,” said Lee, a third-year guard for the Rockets. “He was playing on a recreational court and passed away. The first time I found out, his uncle called me. Then his mother called me. I was just like, ‘It can’t be true.’ Then my college coach called, and my phone kept ringing, teammates, people that were friends with all of us, all kinds of people. Rumph, Lee’s teammate and friend at Western Kentucky, died May 8, 2005, on a recreation center basketball court in Philadelphia of hypertrophic cardiomyopathy, an abnormal growth of muscle fibers on the heart. As with most of the disease’s victims, affecting one in 500, Rumph had shown no symptoms, even on the day he died. Lee did not have to say anything. Rumph could see how he felt. He had been the same way. Like many college freshmen, Lee was just homesick. But he was ready to leave school, having lost interest in his first season in Bowling Green, Ky.
“I was only three hours away from home (Indianapolis),” Lee said. “He was 17 hours away from home. To have him there, talking me through it, showing me around campus, meeting people, doing things, it distracted me from being homesick. He definitely helped out. “He was a junior when I was a freshman. He went through it, too. He showed me everything he did to get over it. It helped. I was thinking about transferring, just leaving, going back home. It was bad. They were roommates through the next summer and next school year and became close with each other’s families. After Lee was drafted in the first round in 2008, he wore Rumph’s No. 11 with the Magic. With the number unavailable with the Nets, he wore No. 6. When he came to the Rockets, he chose No. 5, adding his uniform numbers to reach Rumph’s No. 11. He has a tattoo of Rumph’s likeness — with angel wings and a Phillies cap – on his right arm. But the tributes are more than skin deep. Since Rumph’s death, Lee, 25, has worked with the foundation Rumph’s family established – the Daniel Eric Rumph II Foundation – to raise funds to equip recreation centers with defibrillators and other equipment. 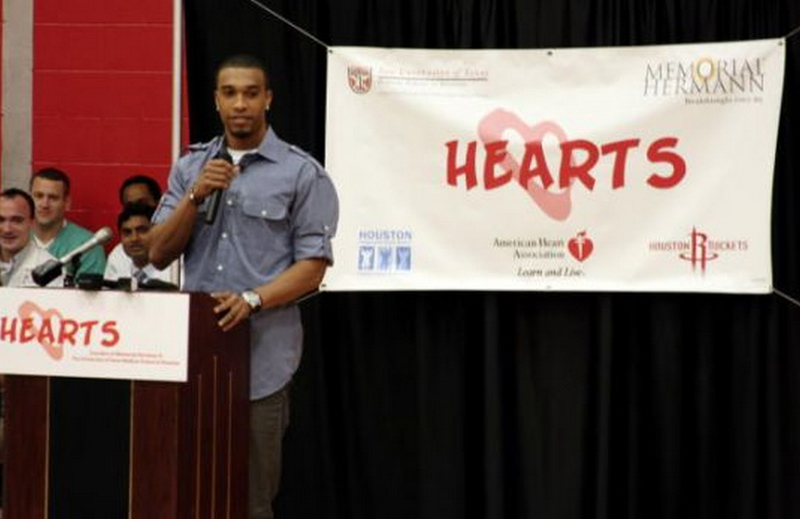 When he was traded to the Rockets, Lee began working with the HEARTS program at Memorial Hermann-Texas Medical Center that screens young athletes for the condition Rumph could never have imagined he had, and speaks to youth groups about the need for testing that could uncover the condition. Years after that night when the phone would not stop ringing, Rumph’s uncle, Mark Owens, called Lee to say he appreciated Lee’s efforts to keep his nephew’s memory alive. “From that first conversation, we continued to build a relationship. We’ve been close ever since. It means a great deal to us all. My sister appreciated the love he gives the foundation. To me, it’s immeasurable. We talk about things he can do for us, keeping it in the forefront. There’s still young athletes dying from it, still work to do. Lee said he does what he can for many reasons. He does it for Rumph’s family and for the other families. He does it for the nights he and Rumph shared their dreams. He does it for the hope that other nights won’t be shattered by phone calls that won’t stop coming.